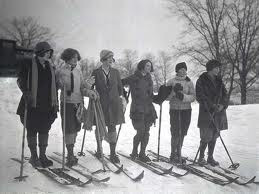 Ex-Term 2012 (formerly known as Interim) is over and our diligent and hardworking BSC students and faculty need a break. Campus is a bit quieter while students and faculty are off gathering up their strength for the Spring Term that starts on February 6th. February 1–3, Wednesday –Friday 8 A.M. – 5 P.M. The Library opens again for Spring Term on Monday, February 6th at 8:00 am. All of the books are listed in the BSC Library catalog and are available for check-out. 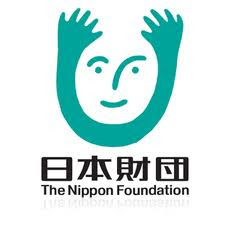 A full listing of the "100 books" can be found at http://www.nippon-foundation.or.jp/eng/worldwide/readjapan/list_100books.html. The new items build on the excellent foundation established by the James Wren Asian Studies Collection. Many thanks to the Nippon Foundation for these wonderful additions to the library collection! Do you ever think about scientific breakthroughs and the ethical questions they pose? 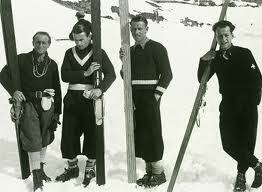 Sometimes the benefits of these experiments are purchased at a great cost to individuals who often remain anonymous. Dr. Melanie Styers' ExTerm class, Tough Choices: Ethical Dilemmas in Science and Medicine explores the implications of medical breakthroughs. Based on one case, the students were moved to action and along with Dr. Styers have organized a fundraiser for the Henrietta Lacks Foundation on Thursday evening, Jan. 19, at 7 PM in Harbert Auditorium. They will show the movie Source Code (with Jake Gyllenhall, Vera Farmiga and Michelle Monaghan) and serve pizza and snacks. Following the movie will be a discussion of the bioethical issues raised by the plot. The suggested donation is $5, but any amount is appreciated. All proceeds will be donated to the Henrietta Lacks Foundation. Dr. Styers reported "the class read the Immortal Life of Henrietta Lacks (a wonderful book!!) The book deals with the history behind HeLa cells, a cervical cancer cell line that has led to many of the most significant scientific breakthroughs over the last 50 years. 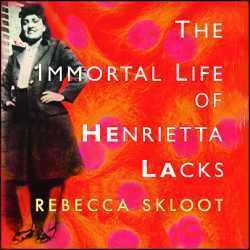 It details how the cells were isolated from Henrietta Lacks (without her consent) and the lasting effects on her family. The book adresses issues related to race, poverty, medical ethics, and education. My students have been very touched by Henrietta's story." 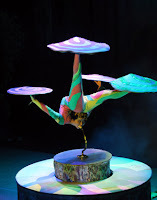 Celebrate Chinese New Year with Acrobatics! One of the most famous acrobatic groups in China, the Nanjing Acrobatic Troupe, will perform at Birmingham-Southern on Wednesday, Jan. 18, in celebration of the 2012 Chinese New Year, The Year of the Dragon. The performance will take place at 7:30 p.m. in Bill Battle Coliseum. The public is invited and the event is free. The doors of the coliseum will open at 7 p.m.
As we celebrate Martin Luther King Day, many of us are unaware of the direct effect that his message had on BSC students. Marti Turnipseed, a BSC student, attended a meeting at the Ensley First Baptist Church, where she heard the Reverend King speak on the need to take a stand for justice. As a result she became the first white person to participate in the non-violent sit-ins at the segregated Birmingham Woolworth's Department Store lunch counters. For her courage to stand up for what she believed to be right, the college administration bowed to outside pressure and expelled her for a year. But Marti returned with her head held high to graduate from BSC in 1964 and then attend divinity school. 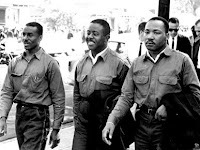 You can learn more about Martin Luther King, Jr. through the BSC Library catalogue. Marti Turnipseed's story and BSC's struggles through the civil rights era have been researched by Professor Bill Nicholas of our History Department; you can find her entry in the BSC yearbooks, available online. Good Friday March held on April 12, 1963. Rev. Fred Shuttlesworth and Rev. 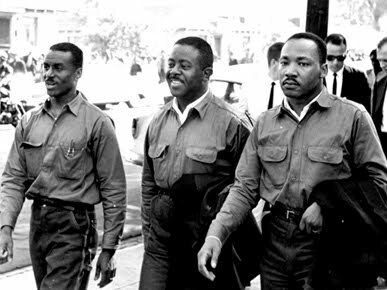 Ralph David Abernathy join Dr. King on a march for civil rights in Birmingham. Photo from the Encyclopedia of Alabama. New SD Card Readers for the Library! Due to student demand, the library has acquired two SD card readers to facilitate photo uploads onto library computers. Since the library is one of the only places on campus that students can print in color, users frequently print photos from their digital devices here. Users can now directly connect their memory cards to the computers, allowing the image files to be selected much like files on standard USB drives. The readers are available for checkout at the circulation desk. Welcome back to Exploration Term! The library will be closed on Monday, January 16, for the Dr. Martin Luther King, Jr. Holiday. We look forward to seeing you during the month of January. On your marks... get set... explore!